The September 2009 Daring Bakers' challenge was hosted by Steph of A Whisk and a Spoon. She chose the French treat, Vols-au-Vent based on the Puff Pastry recipe by Michel Richard from the cookbook Baking with Julia by Dorie Greenspan. To be honest, I almost didn't complete the challenge this month! I was pretty busy with school, and didn't get around to it until this Saturday. Luckily, I ended up pushing through to finish the puff pastry this weekend, and I was really glad I did! See that little hole on the side? That was supposed to be the top of the pastry shell! Oops. Well, despite the cosmetic problems, these little appetizers were totally delicious. The cheese and preserves were the perfect salty-sweet pairing, and the puff pastry was buttery, tender, and so much better than store-bought. They're a little prettier from this angle! 2. Roll out the puff pastry to about 1/8-inch thick. Cut several small circles out of the dough (I used the back of a pastry bag tip). Cut smaller holes out of the center of half the circles. Prick the solid circles with a fork, and leave the circles with the centers removed plain. Brush the solid circles with egg wash, and then place the rings on top. Brush the rings with egg wash as well. Be careful not to allow the egg was to drip down the sides of the circles. 3. Bake the puff pastry shells until they are nicely browned. Allow them to cool. 4. 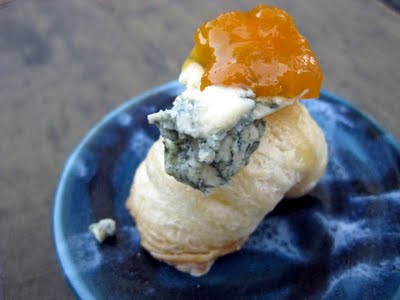 Fill each pastry shell with a small slice of Stilton cheese and top with a spoonful of apricot preserves. I didn't get a great photo of this dish because we ate it too fast! But believe me, it was absolutely delicious. I adore root vegetables, and this is a great new way to prepare them that I'd never used before. 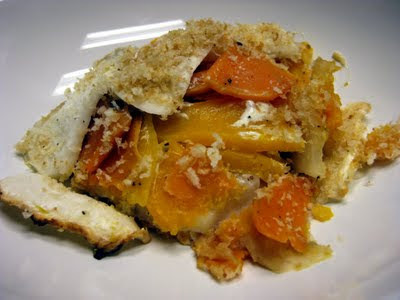 Thin slices of three different root veggies bake together with chicken broth and cream. Crispy panko on top provides textural contrast with a toasty crunch. Amazing! I served this as a main dish with a big salad on the side, and it was perfect for six. You could also serve it as a side dish for more...maybe at Thanksgiving? In the future, I also think it might be fun to change up the root veggies a bit - pretty much any of them would probably be really tasty! You could also dress this up with a bit of browned, crumbled sweet Italian sausage sprinkled between the layers. 1. Preheat the oven to 375 degrees. Peel all the veggies and cut them into pieces just small enough to fit through the feed tube of a food processor. Slice all the vegetables using the food processor into slices about 1/8-inch thick. You can also use a mandoline to slice the vegetables. 2. Spray an 8x12 baking dish with oil. (I used two smaller dishes to make one of them vegetarian with veggie broth - still really delicious!) Layer the vegetables into the dish: place a single layer of potatoes in the dish, overlapping them just slightly, and then season with salt and pepper. D the same thing with the rutabaga and then the squash, continuing until you run out of veggies (you might not end up with an even number of layers of each vegetable). Make sure the season with salt and pepper between each layer. 3. Pour the broth over and around the vegetables. Cover tightly with foil and bake for one hour, until the vegetables are almost tender. Remove the foil and pour the cream over the gratin. Bake for about 30 minutes longer, until the liquid and thickened slightly. 4. Preheat the broiler. Mix the panko with the oil and season with salt and pepper. Sprinkle over the gratin. Broil for about 2 minutes, until golden brown and toasty. Let the gratin stand for ten minutes before serving. This grapefruit meringue pie is a nice change of pace from lemon meringue. 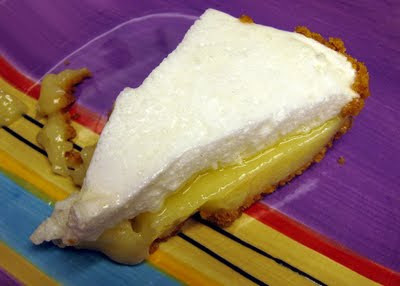 I ended up adding some lemon juice as well to get it as tart as I wanted it (I love tart pie! 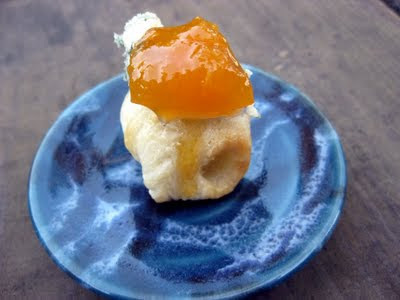 ), but the grapefruit flavor was still prominent and delicious. I love the bitter and slightly floral undertones of grapefruit, and they work really well with fluffy meringue and graham cracker crust. I definitely didn't get my meringue as brown as I wanted it, because I was so afraid of burning it! Luckily, it was still very tasty. Housemate Sebastien said this might be one of his favorite things I've ever baked! In other news, I haven't heard back from the winner of the Frugal Foodie giveaway, so I'm moving on to a second random pick. The winner this time is #2 Mrs. Milne! Congrats on the win, and I'll email you with the details of getting the book. Mix together the graham crackers and sugar, and then mix in the butter with a fork. Press into a pie crust and chill until ready to use. 1. In a medium saucepan, whisk together the sugar, cornstarch, flour, salt and water. Bring to a boil and cook, stirring with a whisk, for 3 minutes, until quite thick. In a small bowl, combine egg yolks with grapefruit juice and zest. 2. Very slowly drizzle the hot mixture into the egg yolks, whisking constantly. Return saucepan to the heat and, whisking continuously, stream in lemon mixture. Add in butter and cook over medium-high heat for another 3 minutes. Taste and add lemon juice or zest if the filling is not as tart as you like. 4. In a small saucepan, combine sugar and water. Bring to a boil and turn heat to low. In a large bowl, beat egg whites until frothy. Beat in cream of tartar and then beat at high speed until egg whites reach soft peaks. Carefully and very slowly, with the mixer turned to medium, stream in sugar syrup and beat egg whites to stiff peaks. 5. Spoon meringue onto pie filling and make sure to completely seal the edges of the meringue with the crust, leaving no filling exposed. Bake for 8-10 minutes, until meringue is lightly browned. Random.org has spoken, and #7, Weedgardener, is the winner of a copy of Frugal Foodie! Send me your mailing address and I'll pass the info along to the publishers to send you your new cookbook. Congrats to the winner! Fine print: You have until Thursday at 5 pm to email me your info, or I'll pick another winner. This month's You Want Pies with That? theme is vacation pies. When I thought of vacation, I thought of camping as a kid, which...let's just say it wasn't my favorite sort of trip! Sleeping on the cold, hard ground, a hike to the campground, and bugs. But! Camping did usually have s'mores, so there was that one silver lining. I decided to make a s'mores ice cream pie in honor of s'mores eaten on camping trips and at cookouts. The graham cracker here is represented by a graham cracker crust. I just love homemade graham cracker crusts...so yummy with lots of crushed cracker and butter. Filling the crust is a toasted marshmallow ice cream. The ice cream base is your basic rich custard ice cream with just cream, sugar, and eggs. In the last few minutes of mixing, I added a toasted marshmallow swirl made of marshmallows melted with milk until caramelized. 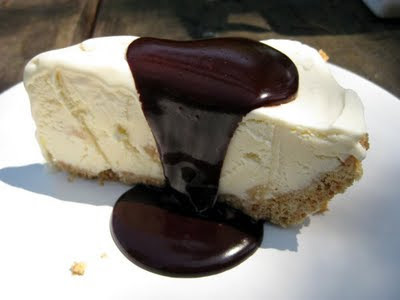 Finally, hot fudge sauce tops the s'mores pie to fill in for the traditional Hershey's chocolate and add some temperature contrast. This pie is extremely rich but extremely delicious. Definitely try it in small slices! 1. As soon as the ice cream is churned, immediately scrape it from the ice cream machine into the graham cracker crust. Smooth the top, cover with plastic wrap, and freeze until firm. 2. 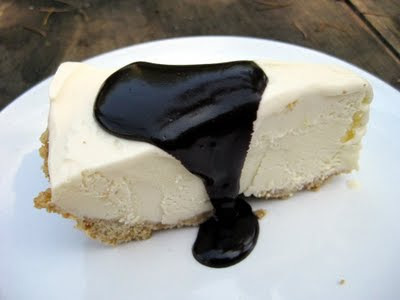 Slice the pie with a knife dipped in hot water, and top each individual slice with hot fudge sauce. Leftover pie should be placed back in the freezer immediately (don't top it with hot fudge). 1. Place the marshmallows and 1/2 cup milk in a heavy-bottomed sauce pot and cook over medium-low heat, stirring constantly, until the marshmallows melt and the sauce attains a caramel color. Use a rubber spatula to stir so that you can scrape the edges and bottom well to pick up the caramelized sugar. 2. When the sauce is thick and caramel colored, add the remaining 1/2 cup milk and stir to combine. Cook until bubbling, and then scrape the sauce into a lightly oiled bowl. Let sit until cooled. 1. Make an ice bath by setting a 2-quart bowl inside a larger bowl filled with ice and water. Put a strainer over the bowl and pour the cream into the bowl. 2. Heat the milk, salt, and sugar in a saucepan until the sugar is dissolved and the mixture is just beginning to bubble. 5. Strain the custard into the heavy cream. Stir over the ice until cool and then refrigerate to chill until completely cooled. Freeze the ice cream base according to the directions for your ice cream maker. In the last few minutes of freezing (after the ice cream base has partially solidified but is not completely frozen), add the toasted marshmallow by small spoonfuls. 1. Melt the chocolate and butter very slowly in a double boiler or in the microwave, stirring frequently until combined. Meanwhile, heat the water to boiling in the small, heavy saucepan. When the butter and chocolate have melted, stir the mixture into the boiling water. Add the sugar, corn syrup and salt and mix until smooth. Turn the heat up and stir until mixture starts to boil; adjust heat so that sauce is just maintained at the boiling point, stirring occasionally. Allow sauce to boil for nine minutes. 2. Remove from heat and transfer to the blender. Blend until the sauce is velvet-y smooth. 3. After it has cooled, the sauce can be stored in the refrigerator. Heat up just the amount you need in a small bowl in the microwave for about 30 seconds. This is one of those dishes that I’ve made many variations of, but Frugal Foodie presented a new and tasty version. Lots of butter coats the intensely lemon-y pasta, and cooking the asparagus in a bit of vegetable stock results in tender and flavorful veggies. We added dots of goat cheese on top for a little tang, but either way this is a very yummy pasta dish that I’ll be adding to my summer repertoire. I used a Meyer lemon here because it's what I had on hand from the backyard, but a regular lemon should work just as well. 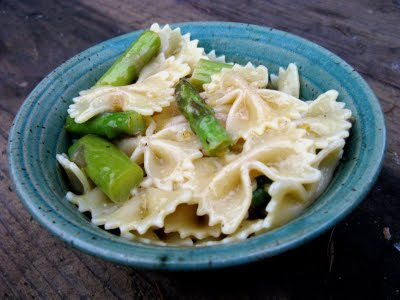 Beware that this pasta is really rich (as you can see from the amount of butter and oil in the recipe), but it's also very tasty and well-balanced with the asparagus and acid. I'd suggest serving it with some simple veggies or a salad. 1. Preheat a covered skillet over medium-high heat. Add the asparagus and then pour the vegetable broth over it. Cover the skillet and steam for 4-5 minutes, until crisp-tender. Transfer the asparagus to a bowl with a slotted spoon, and cover tightly with aluminum foil. 2. Return the skillet with remaining broth to the stove and boil until reduced to 1 tablespoon. Add the butter and olive oil and cook until the butter is melted. Add garlic and saute for 2-3 minutes. Add the lemon zest, lemon juice, and sliced lemon and cook for 2-3 minutes. Add the asparagus and toss to coat. 3. Pour the sauce over the warm pasta, toss, and allow the pasta to absorb the sauce for a few minutes before serving. Optionally top with crumbled goat cheese. I’ve always been really intimidated by canning, but when I saw three pounds of apricots on sale for ninety-nine cents at the grocery store, I knew this was the time to be daring! I messed up the recipe, accidentally leaving out the last-minute addition of lemon juice until the jars were already in their hot-water bath, so the jam had to be refrigerated or frozen to be safe to eat. However, even with the error, the preserves were still absolutely delicious! I definitely look forward to doing more preserving in the future…and next time, hopefully I’ll get it right so I can have shelves lined with beautiful jars! Isn't it cute?! We've steadily been eating through the jars of jam in our freezer, so I think the canning failure was not too much of a problem. While the jam isn't as "gelled" as one that uses pectin, it's still mighty delicious and tastes excellent on morning toast or a PB&J. It will also be nice to have this taste of summer once stone fruit season is over. My canning experiment also inspired me to get my own canning supplies (now that our summer sub-letter has moved out and taken hers back to St. Louis), so you shold expect more canned items on Cupcake Muffin in the future! 1. Halve the apricots and remove the pits. Reserve 5 pits for the apricot kernels (smash the pits to get out the kernels). 2. Cut the apricots into 1-inch chunks. Combine them with the kernels, sugar, and water in a large, heavy-bottomed pot. 3. Bring to a boil, stirring constantly. Cook until thickened, about 15 minutes. 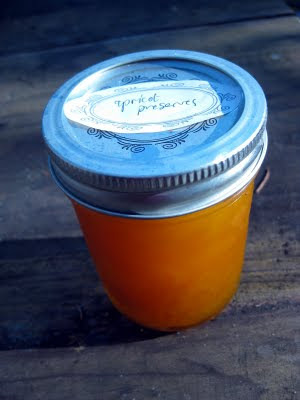 As the apricots cook, skim off the foam with a spoon and save it in a clean glass jar. It settles into a yummy syrup (I used it in my latest Daring Bakers challenge). 5. Ladle the preserves into warm, sterilized jars. You can store the preserves in the fridge for up to a month, or process them in boiling water for twenty minutes for longer-term storage (see below). Sterilize the canning jars first, by simmering them for 8-10 minutes. Add the lids just after you turn off the flame to soften the rubber seals. Fill the jars while still warm to within 3/4 inch of the rim. Wipe off the rims with a clean, wet cloth and seal the jar with the lid and metal ring. Place on a cooking rack in the bottom of a large pot of boiling water, not touching. Cover the pot and boil for 20 minutes. After 20 minutes, remove the jars and let cool to room temperature. Check the seals after 24 hours; they should be completely concave and not pop back under pressure. If any of the jars aren't sealed properly, just freeze the jam or keep it in the fridge for up to one month. Lara Starr (author of The Frugal Foodie) was kind enough to offer up a copy of the book as a giveaway for my readers. Thanks, Lara! To enter, just comment on this post telling me your favorite frugal foodie-style dish. What do you love to cook or bake that doesn't break the bank? For those on Twitter: You can also get a second, bonus entry in the giveaway by tweeting about this contest and including a link to this post (I'm @cupcake_muffin). Then leave a second comment here letting me know you did so for your second entry into the contest. Fine print: U.S. addresses only, please. You must leave a way for me to contact you with your entry (either your website address, email, or twitter username). This contest will run until September 12, and then I'll draw a winner using random.org. Just wanted to let you know I have a cookbook review up at The Daring Kitchen. I'll be posting some sample recipes I tried from the book over the next week or so. I was delighted with all the recipes I tried, although I thought the title was a bit misleading. The Frugal Foodie is currently on sale at Amazon , so be sure to check it out!